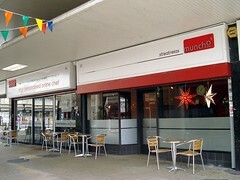 Muncho was a cafe and sandwich shop in Croydon. It has now closed. Cafe and sandwich shop in Croydon. It's located on St George's Walk, a small pedestrianised part-covered shopping mall just off the High Street. It has indoor seating for around 16-20 people. Most of this is provided by upright chairs at dark varnished wood tables, but there's also a couple of sofas facing each other across a low coffee table. Matte black tiles cover the floor, and the walls are hung with vintage travel posters, art prints, and other interesting items photo. There's more seating outside on St George's Walk itself. As well as various salads and sandwiches, they also do things like pasta and omelettes, and Turkish food such as lahmacun (a sort of rolled-up pizza), mezze selection (listed as tzatziki, tabbouleh, hummous, pitta bread, and choice of other items including falafel), and Turkish breakfast. Kake first visited on a Wednesday lunchtime in April 2013. There were a fair few other people in, but a couple of tables free. Music was playing; initially easy-listening sort of stuff (not too loud to impede conversation, but loud enough to be a little irritating) but they later switched it to classical piano. Turkish breakfast (£4) photo consisted of black olives, grilled tomatoes, fried eggs, fried red onion, and a choice of grilled halloumi or spicy sausage; I chose the halloumi. It was quite tasty. The halloumi wasn't rubbery at all, the eggs had runny yolks, and the tomatoes had more flavour than I'd expected at this time of year. The large quantity of olives made it overall a little salty in combination with the halloumi, but I dealt with that by leaving half of them. The accompanying Turkish bread was a bit too chewy. A cup of freshly-squeezed orange juice (£1.90 for the "small" size) was quite sharp; I liked this, but it might be a bit of a surprise if you weren't expecting it. Kake and Bec visited again on a Friday lunchtime in April 2015. A jacket potato with cheese and beans photo was a generous serving. Panini with mozzarella and pesto photo had a last-minute substitution of feta for the mozzarella due to the kitchen running out (they did ask first); this actually worked very well. There were plenty of green leaves in the panini itself, and a lovely fresh side salad of tomatoes, lettuce, red onions, and cucumber. Kake tried the Turkish breakfast again (now £5) in May 2017, this time choosing the spicy sausage option photo. The eggs again had runny yolks, and the olives weren't too salty this time. The red onions were very nicely caramelised, and the sausage had a good texture with just a hint of chilli heat. The bread was again a little too chewy, but only just. Accessibility: The front door is a bit stiff to open. Step-free to get in, and step-free throughout once you're in, including to the loos (a reasonably spacious unisex cubicle, though the door does open inwards). Last edited 2017-10-06 08:47:50 (version 6; diff). List all versions. Page last edited 2017-10-06 08:47:50 (version 6).